A quickie trend to share with all you mommies, daddies, brides and grooms that is simply delicious and perfect for summer time and your peach of a flower girl. Braids have been going strong for the past year or so on all the Hollywood red carpets, but the milk maid braid has made a recent comeback. The look isn't just for Princess Leia look a-likes at comic conventions. 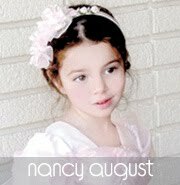 It's the perfect summer look because it's it will keep your little princess cool and it's no fuss and easy to do. When the heat is on we are all looking for short cuts to spending less energy. This is the ultimate quickie up do that is so easy your little one could probably do it herself! I take that back. Bobby pins and tender heads are not exactly fool proof. All you need is 2 - 4 rubber bands and a few bobby pins. Make sure the pins match your the darling's hair color. Last thing you want to ruin a cute ensemble is mismatch bobby pins. 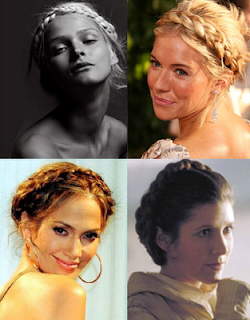 You can either have a sharp neat milk maid braid look like Princess Leia (see photo above) or keep it messy. Either way, part the down the middle. Make two braids. You can do the two braids straight from the head or make a pony tail first with two rubber bands then braid then tie off the braids. Either way is fine. If you do it the second way, make sure to wrap a small piece of hair around the bands to conceal them. Take one braid and drape it across the top of her head and secure with a few bobby pins. Take the other braid across the head covering the tail of the first braid then slightly tucking it under, then secure with pins. Voila! You should have an instant up do that is appropriate for any flower girl. Hope everyone's beating the heat and staying cool! 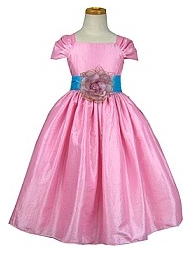 Simple Taffeta Pink Flower Girl Dress with Blue Accent Item J1320G-PK-BL. I love this dress. It's simple yet had just the right accouterments to add some spice. I think it's a perfect dress to go with the milk maid braids. The flower detail in the center with the pop of electric blue is adds that perfect dash of interest without being overbearing. Our Little Flower Girl Goes Back To School!